A couple nights ago I got a text from my friend Rory which came on the heels of a news alert on my phone which promptly followed the carrier pigeon that arrived at my window which was preceded only by sirens wailing all over Earth – that is to say, did you see? 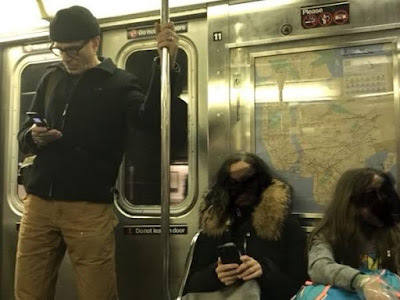 Sir Daniel Day-Lewis was spotted on the New York subway, by Daily Beast writer Karen Han, using a, ahem, cough, cough, flip phone. First, Han simply stated this information before providing actual photographic evidence, which one might argue was an invasion of privacy though another could mount a counter-argument that this photo was simply in the interest of the public good and therefore not invasive at all. Either way, if the Internet has often swooned over the eccentricities of our formerly greatest working actor, this sent them into jokey overkill, perhaps best emblemized in Vanity Fair’s Katey Rich comically speculating that “Daniel Day-Lewis built that flip phone from scratch after a three-year Samsung internship”, which is a play, of course, on Day-Lewis’s infamously intense methodology, the go-to joke for any situation involving him, and one riffed on this past Thursday evening ad nauseam. But, there were other takes. “(W)hat should we make of this new information?” wondered Hannah Gold at Jezebel. “Maybe it will finally give us, as a culture, permission to ditch our ‘smart’ phones that track us and shrink our attention spans.” Others, like The Evening Standard, cited his flip phone ownership as heroic, writing that Day-Lewis “has defied peer pressure and shunned modern technology.” But has he? I mean, Daniel Day-Lewis is the dude who twelve years ago told The Independent that he “can spend upwards of a week, ‘just staring out of the window, watching the wind whip across the Wicklow hills. 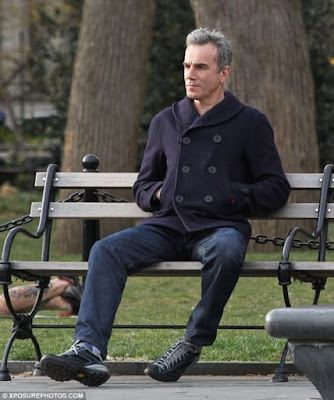 Some people will consider this shamefully neglectful when one considers that there are always more pressing matters at hand, but for me, I have to tell you, it is time very well spent.’” Now you’re telling me that Daniel Day-Lewis is, like, looking at the grocery list, or texting with his wife (my God, what do you think Rebecca Miller texts are like? ), or accepting a LinkedIn request (probably from Vicky Krieps)? THIS IS THE WORLD WHERE YOU WANT TO LIVE??? It might be tempting to argue that all this proves he, Daniel Day-Lewis, is just like the rest of us, idling by looking at his phone, whether that phone is his preferred Motorola Razr or an iPhone Codswallop. But while it might be unfair, and while it might be symptomatic of how we confer god status to mere humans, the myth surrounding Daniel Day-Lewis always stood for something more, suggesting a life of cordial rejection of our exhausting collective norms. There is that tale Bruce Springsteen wove on his episode of VH1 Storytellers about being spotted outside a, uh, adult establishment by two people who exclaimed that he, Bruce Springsteen, wasn’t supposed to be there. To which Bruce replied something to the effect of not really being Bruce but a different Bruce, and that the other Bruce, the real one, was off attending to many Springsteen-ian good deeds. That’s what I thought of when I saw Daniel Day-Lewis on the subway looking at his phone. That wasn’t really DDL, that was a different DDL, and the real DDL was off studying the effects of chemical contamination on Ohio River communities, or apprenticing at Area 51, or just staring out of the window, watching the wind whip across the Wicklow hills.